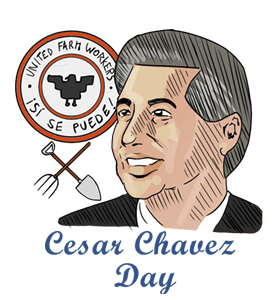 ﻿Cesar Chavez Day: Calendar, History, Tweets, Facts, Quotes & Activities. Cesar Chavez Day commemorates the life and achievements of Cesar Chavez. Cesar Estrada Chavez was a Mexican-American farm worker who was a Civil Rights and Labor Movement activist. Chavez stood and fought for labor rights using nonviolent resistance, such as boycotting and fasting. At the age of 17, Chavez served in the U.S. Navy for two years. After serving in the Navy, Chavez worked in the fields until 1952, when he became the organizer of the Community Service Organization (CSO). He cofounded the National Farm Workers Association in 1962 with Dolores Huerta Chavez, an association which he used to create unions and lobby for better pay and safer working conditions in the farming community. Chavez passed away peacefully in his sleep on April 23, 1993. In recent years, President Barack Obama has proclaimed that Cesar Chavez Day be observed on March 31. On August 8, 1994, President Bill Clinton posthumously awarded Cesar Chavez with the Presidential Medal of Freedom. The Presidential Medal of Freedom is the highest honor that can be awarded to a civilian by the United States of America. It is presented to individuals who improve the lives of men, women and future generations. The Medal was accepted by Helen Chavez, wife and working partner of Cesar Chavez. Cesar Chavez's 36-day Fast for Life was aimed at creating awareness of pesticides used by the grape industry and their harmful impact on farm workers and children. During this fast, Chavez lost 30 pounds, developed renal problems and severe muscle wastage. We cannot seek achievement for ourselves and forget about progress and prosperity for our community... Our ambitions must be broad enough to include the aspirations and needs of others, for their sakes and for our own. - Cesar Chavez. I call upon all Americans to observe this day with appropriate service, community, and education programs to honor César Chávez's enduring legacy. - President Obama. Sí, se puede (English translation, Yes, you can) is the motto of the United Farm Workers that Cesar Chavez established in 1972. During President Barack Obama's Democratic primary race for the U.S. Senate, Yes, we can! was used as the slogan for Obama's presidential campaign, inspired by Chavez. Watch the movie Cesar Chavez (2014) to learn more about Cesar Chavez and the principles he stood for. Join, volunteer and walk in the Annual César E. Chavez March for Justice in San Antonio, TX. Learn about other international activists who, like Cesar Chavez, also used nonviolent peaceful demonstrations to support causes and bring about change. Some notable leaders include Mahatma Gandhi, Rosa Parks and Nelson Mandela. Cesar Chavez protested against the use of pesticides that posed harm to the health and well-being of farm workers and their children. Learn about alternative farming techniques that do not utilize pesticides. The Northwest Center for Alternatives to Pesticides (NCAP) provides resources, opportunities for involvement and educational material. Read biographical novels about Cesar Chavez, such as The Crusades of Cesar Chavez: A Biography (Miriam Pawel, 2015), Cesar Chavez: Autobiography of La Causa (Jacques E. Levy, 2007) and An Organizer's Tale: Speeches (Cesar Chavez and Illan Stavans, 2008).